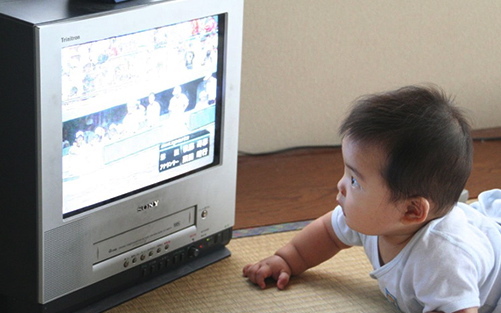 Today, it is common for children to start watching TV at a very early age, at two or even younger. According to statistical data, one third of zero to six-year-old children live in homes where the TV is on “almost all” or most of the time, and an additional one third of these children live in homes where TV is left on at least half the time, even if no one is watching. As the above remarks from a grandmother of a child shows, many adults believe screen time is a critical part of early childhood development. A recommendation from the American Academy of Pediatrics to avoid TV for children under the age of two, and to limit screen time at two hours per day for those over two, is largely ignored. Many parents, on the contrary, believe that selective educational programs such as Sesame Street or Baby Einstein, available through applications, video games and DVDs, will help to stimulate the young minds and improve learning skills. Some parents even assume that early intellectual advancement of their offspring is dependent upon those specially designed multimedia tools. Unfortunately, the powerful marketing lobbying for early childhood educational programs on TV, publications, and Internet largely overwhelms the cautionary messages from researchers and the American Academy of Pediatrics. Many parents genuinely believe that TV and computers have a central role to play in children’s education and upbringing, even though young children cannot differentiate between fantasy and reality. It’s not rare to see babies with iPad attached to their strollers, or young children absorbed by their smartphone screen for a few hours straight while dining with family in a restaurant. Instead of being aware of the surrounding environment and developing social skills by interacting with other people, these children are literally shut-off from the real world, missing every single opportunity to develop the needed skills to become well-rounded individuals. In my personal experience, I noticed that it only takes a few minutes of screen time exposure to get my son into a tantrum fit once the device is turned off. The decision to remove the TV from our home was done long before he became part of the family, but I do anticipate lots of heated discussions about bringing back the TV once he grows older and starts interacting with other kids in school. A TV-free home comes with some inconvenience, and I appreciate it is not for everyone, but I believe it is an important gift for him. 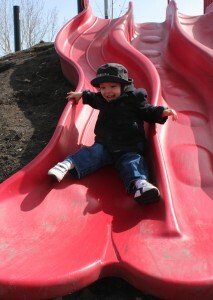 As he gets older, he will understand that all the role-playing, structure building with wooden blocks, outdoor walking and running, climbing and sliding in the playground, constant talking, singing, and story reading are much better than constant passive screen-time. Take away the TV, a new happy child with his own meanings, curiosity and ideas will emerge. The Montessori Educational Approach. The Connection to an Emerging Mighty Learner.